Hidden within the North Coast lies one of the many wonders of the Victorian Era: The Carson Mansion. The Ingomar Club is a private community of individuals dedicated to the preservation of the most photographed house in America. Envisioned in 2004, their original website was struggling to meet modern expectations. The Club tasked EvenVision with reinventing its digital platform and redefining their online presence. Our solution focused on refinement & accessibility for visitors, Club Members and the staff that serves them through a mobile-friendly, robust & flexible CMS & CRM system. Their new website acts as a valuable toolbox for the Ingomar Club helping to further their organization's goals while cementing their market position as the Premier Club of Northern California. Over 14 years old, their original website was based on a development framework that was no longer supported. Their old online presence had begun to misrepresent the Ingomar Club's world-class quality & struggled to meet modern accessibility expectations. Staff struggled to maintain the site which compounded issues with a site that Club members used infrequently. Provide a truly unique & refined presentation of the Mansion & the Club. Provide Club Members a unified valuable personalized experience. Provide the Club Staff a simple & robust toolbox for serving members. Provide the Club access to tools for objectively understanding the value of their website. A thorough understanding of the Ingomar Club's Mission and Membership's unique needs, allowed our team to craft a unique digital platform with custom tools that matched their exact needs without distracting and unnecessary bloat. Our rich knowledge of their brand and history allowed us to construct an online presence designed to exceed their expectations and to establish a new level of excellence to reach new generations without alienating their core. Over 14,000 people have visited the Ingomar Club's new website. New viable revenue streams have been discovered through the website's increased activity, bringing new members to the club, and new events to the Mansion. Clear & consistent communication was critical to the success of this project. This allowed a complex project to be tackled within a tight 14 week period while keeping to a strict budget. Before the start of this project, we proactively listened which required investing quality time in understanding the organization's unique challenges & history. We believe the end result speaks for itself. The Ingomar Club represents the highest level of elegance in Northern California and Humboldt. They are the Premier Benchmark. Driven to new heights EvenVision crafted a website unique to their calling. The Ingomar Club's original website allowed visitors to explore the Mansion but did not represent the Ingomar Club well. Paul McNally, the Ingomar Club's General Manager, challenged EvenVision to construct a non-member visitors experience that provided the original functionality while accounting for a modern user experience and a redefined tone. In addition, we were tasked to create a site that would further the Club's strategic goals by presenting their mission of preserving the Carson Mansion with displays and dialogue that communicated and invited qualified prospects to inquire about membership while further establishing the Carson Mansion as the premier event destination of Northern California. Remove the website's design from the center of attention allowing the Carson Mansion to speak for itself. Provide a more refined, accessible user-friendly website by implementing responsive web design best practices. Construct clean and structured navigational pathways that encourage exploration through streamlined dialogue. Carefully curate images and text to provide immediate and lasting impressions of quality. Images speak a thousand words. The Carson Mansion was constructed with no expense spared. The richness of details, the quality of materials and the overwhelming collection of storied artifacts leaves smiles of wonderment on the faces of all who enter. Seeking to showcase this richness, we presented the Club with a site that was functional simple, refined, and design restrained, allowing for the images of the Carson Mansion to take center stage. We found inspiration from art galleries which act as blank canvases that amplify the beauty of art present without being a distraction. By focusing on the Images, this provides room for the Mansion to be showcased in all it's splendor while giving the website a clean, timeless appearance, that can be updated with new images to dramatically change the overall look and feel depending on the season. The Club now has the ability to present a continuously fresh image, giving them the ability to keep their identity up-to-date without the need for fundamental design changes. People travel from all over the world to view the Carson Mansion. While the Mansion itself is not publically accessible, the website is. To reward traveling visitors who wish to peer inside we constructed the website with mobile-friendly responsive web design best practices. This allows visitors on the outside to peer in and digitally explore the Mansion's richness with ease. Furthermore, we utilized a content distribution network to improve website performance allowing visitors to travel through the site quickly and efficiently without hindering delays from downloading uncompressed data. Mobile Access accounts for 60%+ of all Site Traffic. Navigation pathways & streamlined dialogue. About - Learn about & explore the Carson Mansion. Membership - Learn about & inquire about Ingomar Club Membership. Events - The social aspect of membership & the gathering of the community. Beyond these simple navigational pathways, we crafted a delightfully unique multi-faceted rich menu system that held to this structure and allowed for quickly exploring the various components of the website no matter how deep into the site's architecture a visitor may go. This dramatically improves the ability for visitors to navigate the website and tour the various pages within the site. Average desktop visitor explores 4.64 pages. To fully cement this structure, we worked alongside Mr. McNally and his team to streamline the site dialogue making sure it not only struck the proper tone but spoke clearly to the objective of each section and the overall goals of the Club. The Ingomar Club has a unique style & tone. Fascinated by their vision we crafted a non-member experience that immediately leaves a lasting impression of world-class excellence. The Club's new site needed to facilitate a valuable experience tailored specifically to their members. While the older site focused on distributing information, we built the new site to encourage frequent member visits and interaction with specially designed points of engagement. Our goal was to provide members with a delightful experience that would act as an extension of the Club Membership promoting the regular community activities & Club involvement. Provide an easily accessible unified mobile-friendly secure members-only experience. Construct a member dashboard focused around Members Events - the lifeblood of the Club. Provide personalized points of engagement through new features that encourage community behaviors bringing the Club members closer together. Member activity on the new site has increased by on average by 600% within five months. The Ingomar Club's Member community is as unique as Mansion they call home. We were able to meet their unique needs and requirements by investing time from the very beginning to develop a comprehensive understanding of the challenges that members faced with the previous site. A secure Member sign-in & landing Dashboard section focused on Events. A comprehensive Club Event Calendar System w/ Mobile friendly list display & automated event archive system w/ event gallery system. The foundations of a robust event reservation experience, which streamlines member submissions w/ autocomplete webforms + guest reservation + reservation list & staff confirmation. Lunch & Dinner + Private Event Hosting request sections. Carriage House reservation section w/ calendar display of reserved dates. Comprehensive club roster, w/ quick search & filter options for discovering members. Individual Club Member profiles w/ customizable rich information sections. Club Leadership displays & quick contact forms. When it came to making the experience speak, we knew that our strength lay in perfecting the little details, making sure that every element worked smoothly removing distractions. Transitioning from White to the historically important Gold for the main navigation backgrounds as a sign-in confirmation & quick staff troubleshooting. 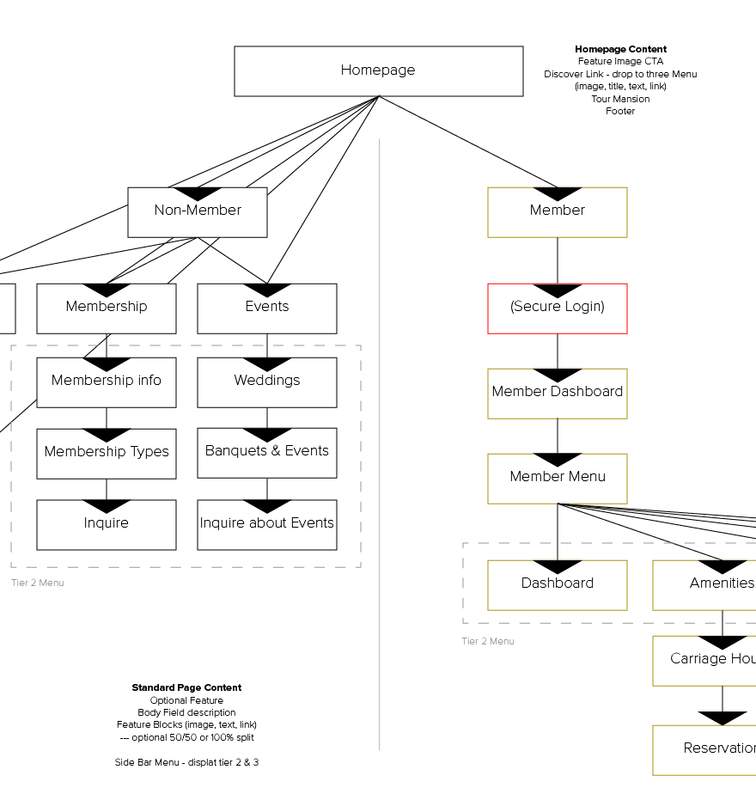 Simplified member's navigation for ease of exploration & access to both the membership & non-member experience while signed-in providing a single unified website. Transition in Iconography from Carson Mansion to Ingomar Crest & additional subtle designs that provide a unique & exclusive experience to members. Clear submission confirmation notifications for all web forms. Contextualized information displays for member-specific interactions such as reservation inquiries. No matter how intuitive a system is, there will always be a learning curve as change affects people differently. To ensure the immediate success of the website we worked closely with the team at the Ingomar Club to make sure that the launch went smoothly and to put systems in place to walk members through their new site and new features. Members newsletter announcement design & publication - this had a 58% open rate & 31.7% click-through rate, an all-time record for the Club's Newsletter system. Members Introduction page with simple instructions & FAQ. A private video introduction was created to showcase and walk member's through the new site's unique features. Combined with extensive staff training the launch of the website went off without a hitch, letting members quickly access and begin to utilize their new website. The Ingomar Club is well known for truly extraordinary service. EvenVision constructed Staff tools to improve accessibility and add value to their member's overall experience aimed squarely at meeting the Clubs need for continual improvement. The site for the Club Members is only useful if the Staff can maintain it. Moving to a new platform, it was critically important that the Staff could maintain it with ease, be responsive to their Club patrons while also publishing beautifully polished and engaging content. Our goal was to make the site a better tool for the Staff to serve Club Members. Robust, simple & easy to use Content Management System for the staff to quickly update and maintain the site's various types of content through tiered access. Ability to quickly add new members and monitor site usage. Ability to quickly mark Carriage House reservations on the calendar. Automated content distribution & archiving on site, allowing for single content entry. Ability to quickly add Events + ability to customize entree selection for individual events for members to make reservations. Reservation request overview & request confirmation system. Bulk Member edit overview, for quickly updating information, and swapping out leadership. Automated email notification to Staff for web form submissions & reservation requests. One challenge the Ingomar Club faced with was the extensive archive of content that had accumulated over the years on their original website. EvenVision provided content migration support, quickly and efficiently moving key content from their old website. Post-migration we reviewed the of content, requesting updates in key areas while making sure to utilize the website's comprehensive tools to display the content in a visually appealing fashion. Our Content Management System is designed to help control content placed on the site with preset styles that help to lock the overall look and feel of the Ingomar Club. This framework is designed to provide just the right amount of flexibility for the Staff to make unique content while keeping the overarching design aesthetic intact. The new digital platform for the Ingomar Club provides the framework for a unique Client Relationship Management (CRM) system designed to help manage interactions with their members and to help the Club stay connected & engaged. This system is developed around the organization's core values of community and designed to encourage positive interaction and value for their members. Our CRM system provides the Club with meaningful data to help them identify new opportunities and streamline future services with comprehensive platform expansions. This makes their digital platform a valuable system for their organization that can grow alongside their unique needs. Member Reservation Inquires through the new site surpassed 200 within the initial five months. Paul McNally made it clear from the beginning that the new site should further the goals of the Ingomar Club and work as a marketing tool for their organization. By carefully constructing a section dedicated to membership the new website successfully sparked interest in the local community, bringing successful membership inquiries from qualitative prospects. The new site features a section dedicated to marketing events as it is a core component to the continued preservation of the Carson Mansion and the health of the Club that is dedicated to it. What was unexpected was the genuine inquiries from the community seeking to host truly exceptional events at the Mansion. Qualified inquiries have provided the Club with a potentially viable new source of revenue to help maintain the Carson Mansion that was previously unexpected. The new site has seen an increase in contact submissions from members of reciprocal clubs as the new system has provided a visually attractive and desirable location for dining & visiting while in Humboldt. In discovering the opportunity, the Club staff are working to develop a section on the site focused on reciprocal club members to make them aware of the exceptional services the Ingomar Club offers to their members and visitors. 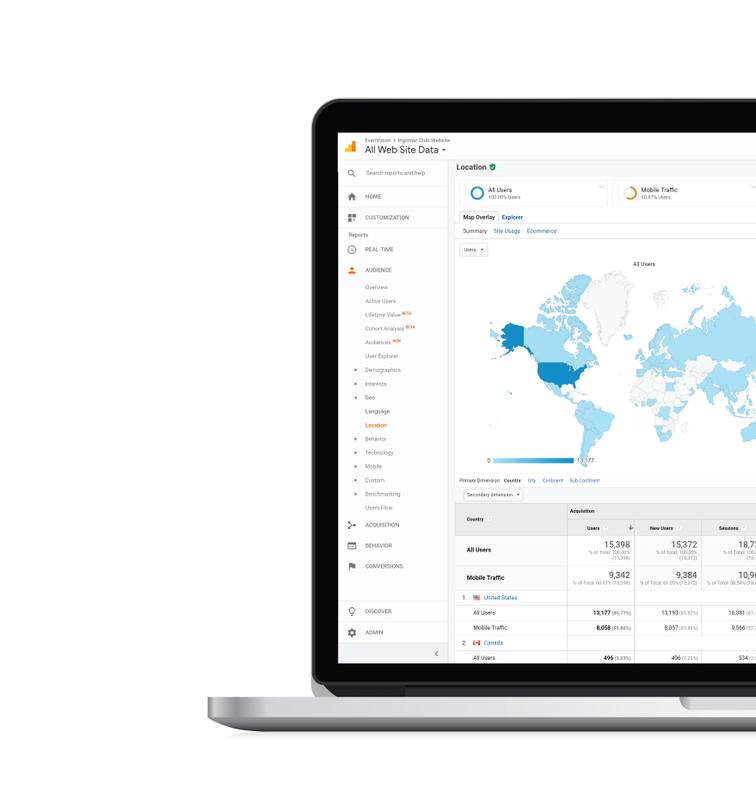 Easy access to comprehensive analytics & EvenVision's team, allows for the Ingomar Club to not only discover the quantifiable value of the various components but help interpret that data and translate it into actionable items for future development. With precious funding, the access to richly detailed data & and interpreters that have a deep understanding of their organization's unique qualities empowers them to make strategic investments in the continued development of new tools & features for their digital platform. 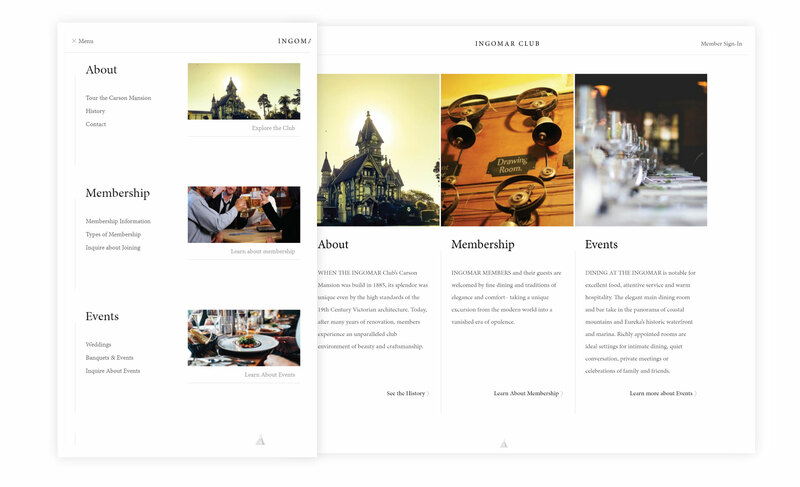 EvenVision worked with the Ingomar Club to refine their visual aesthetic, breathing life into their digital presence. 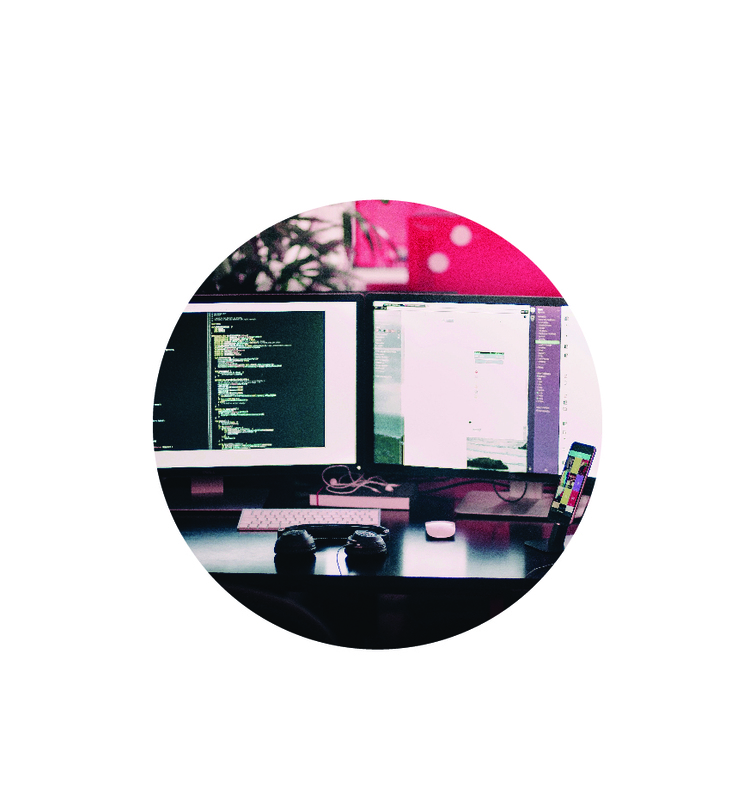 Our approach allowed us to produce a site that removed excess and focused on simple quality interactions. We built custom tools that were robust for future expansion and a framework that maintains the high-quality presentation that the Carson Mansion & their Club Members require. The results: a new digital platform that has transformed their online presence giving the Ingomar Club a professional, unique and quality presence that leaves an immediate and lasting impression while encouraging members to participate in their vibrant community. Our team invested time to understand and appreciate the Ingomar Club's unique history and community. This allowed for us to approach their unique challenges with care and consideration for past decisions while working to set them up with a foundation for success to move forward without leaving anyone behind. Our work focused on developing systems that provided the highest return on investment, making sure to be stewards of their precious funding while giving them tools that would provide a combination of immediate as well as long-term value to their Members and the Club. Our project with the Ingomar Club from proposal to launch was a reflection of our dedication to understanding our client's unique nature. The Club's new digital platform required flawless execution. The Carson Mansion deserves a truly unique digital presence and the Club Members should be able to look with pride at what they are a part of. Therefore it was critically important that our fit & finish was to the highest standards. In addition, it was of the utmost importance that the new tools were as intuitive to use for the members as they were for the staff. This demanded that even the back-end had to be carefully thought out and considered. Through careful user testing, and quality assurance reviews we managed to build complex backend systems with a simple polished front-end user interfaces that provide delightful interactions for both members and staff alike. Understanding, and driving forward with data. It is important for the Ingomar Club to understand the real value of their investment, and even more so to understand the importance of individual items & tools at their disposal. Therefore, we developed their digital platform to generate meaningful data with simple methods for gauging engagement of the members across a myriad of metrics. Armed with actionable data, the Club Leadership & Staff can make decisions moving forward based on objective facts with measurable returns on investment. Access to data further fuels the discovery of ways to improve their services, update systems and develop new viable revenue channels for the Ingomar Club to continue their mission of preserving the Carson Mansion and serving their members.